I hadn't thought of that!!! Bob bitten by a zombie, and when the 'hunters' ate his flesh, they ingest the disease. Interesting thought. New episode tonight, I believe it's called "Four Walls & a Roof". Turned out Bob was bit, but whether or not his 'meat' was tainted was something we won't find out, given what Rick and the others did. Father Gabriel's secret is out, if he was truthful......he locked himself in the church and stayed in there, listening to his parishioners die outside in a zombie attack. Daryl is back, not sure what's going on with Carol, that she was hidden at the very end. I'm assuming that next week we find out about Beth. Good recap, except that I think the person hidden at the end was Beth. If it were Carol, she would have just walked out of the woods and said hi. Daryl wouldn't have to prompt her in that ominous way. Plus, I hadn't realized this when I watched last week's episode but somewhere I read that when Carol went out to the car -- before Daryl showed up and then they spotted the vehicle that took Beth and went after it -- she was planning to go off on her own. So maybe she did. I guess we can only wait until next week. Hope that Carol is still around. I don't recognize what episode that's from, is it from when she was at Terminus? The recapper at Vulture assumed that Daryl was calling to Carol, who would come out with Beth, who would be in bad shape. I don't know if one can assume Carol is there. But I missed a few key moments on last night's show because my DVR wasn't working the way I wanted it to, so maybe the recapper spotted something I missed. I watched it 'live', and there really wasn't anything to indicate it was Carol. Among other things, apparently hatchet-wielding Rick severed Gareth's fingers before chopping him to bits. Oh, and I missed Bob informing Gareth that because he'd been bit, the Terminites were eating "tainted meat." Some pretty important parts, no pun intended. Yeah, I saw both those scenes. Rick was intense. Good epsiode. 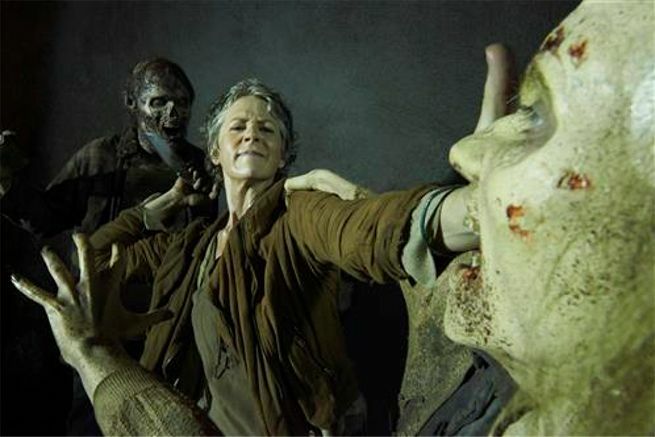 I think the person(s) in the shadows are Carol and Beth - Carol helping Beth..